United States, India, Germany, United Kingdom & Czech Republic are where most visitors come from. Topics: Services, Portfolio, Articles, Notes, Labs, and Take A Look…. aaronrussell.co.uk Choosing the right print process: lithographic or digital - Aaron .. The site has about 2,434 users daily, viewing on average 1.19 pages each. Its 2 nameservers are ns2.daily.co.uk, and ns1.daily.co.uk. 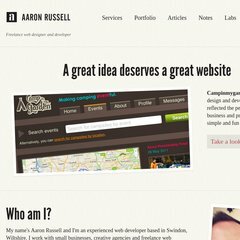 Aaronrussell.co.uk's server IP number is 89.145.83.50. It is hosted by Vmlinux Ltd Ipv4 Assignment (England, Hempstead,) using nginx/1 web server. PING www. (89.145.83.50) 56(84) bytes of data.